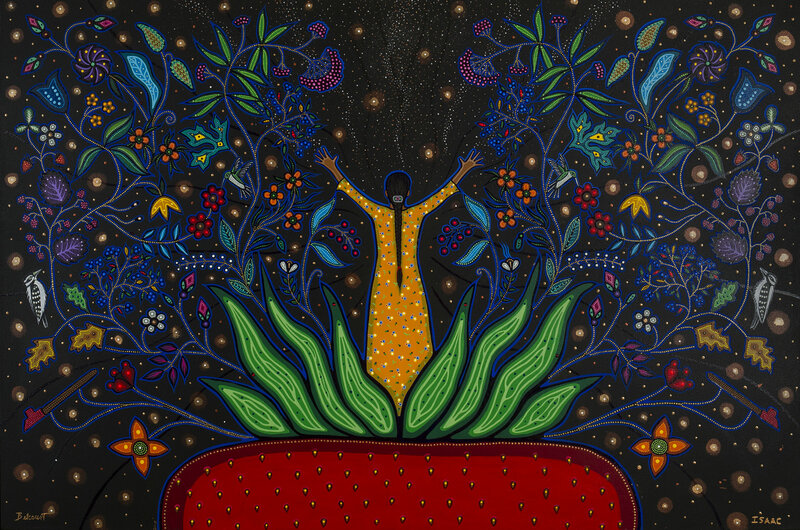 Uprising: The Power of Mother Earth charts Christi Belcourt’s artistic career beginning with early works showcasing the natural world’s beauty and on to her large sweeping murals, including her collaborations with knowledge holder, storyteller, and emerging visual artist Isaac Murdoch. Spanning more than 25 years of art-making, the exhibition of about 35 works celebrates Belcourt’s many inspirational, artistic, and collective achievements. The exhibit also features Murdoch’s art whose iconic images, including Thunderbird woman, has been become an international symbol of the Indigenous resistance movement against resource extraction. Belcourt’s 2002 painting The Conversation – one of the most popular pieces in the Thunder Bay Art Gallery’s permanent collection – is made of dots that the artist created dipping the end of a paintbrush or knitting needle into the paint and pressing it onto the canvas. Like many of Belcourt’s best-known paintings, the piece evokes the traditional beadwork of First Nations and Métis women. Both Belcourt’s art and her poetry inspire reflection and conversation. People love Belcourt’s works showcasing beautiful twining stems, flower blossoms, and root systems which highlight the abiding connection of all life across Turtle Island (North America). 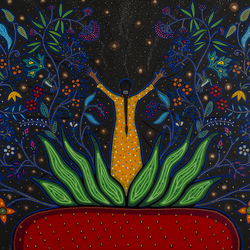 In fact, in 2015, Belcourt’s Wisdom of the Universe (2014), was voted the visitors’ favourite artwork in the Art Gallery of Ontario’s entire collection. Belcourt’s collaborative work with Murdoch calls for action. Together, they produce powerful images championing the restoration of balance between all living beings and the natural world. People will be able to appreciate their dedication, energy, and determination in works such as New Beginnings, 2014. 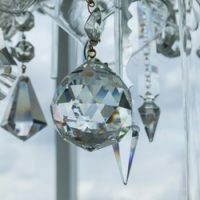 Co-produced by Thunder Bay Art Gallery and Carleton University Art Gallery (Ottawa), the exhibition will tour nationally to galleries in Ottawa, Joliette, Regina, and Winnipeg. 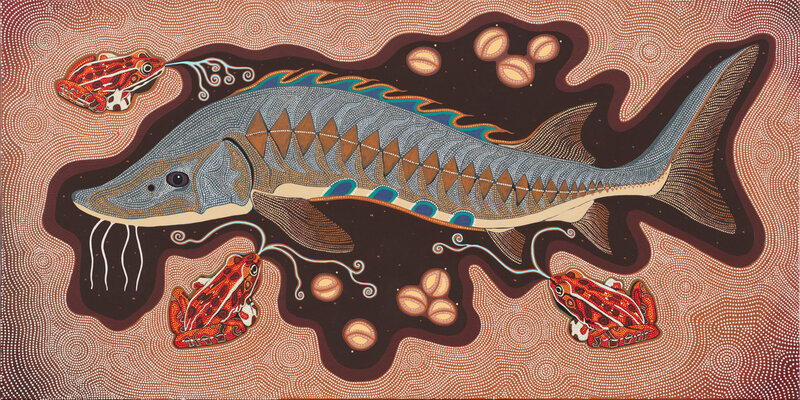 © Christi Belcourt & Isaac Murdoch, New Beginnings (detail), 2014. On loan from the Wabano Centre for Aboriginal Health, Ottawa, Ontario. Christi Belcourt is a Michif (Métis) visual artist with a deep respect for Mother Earth, the traditions and the knowledge of her people. In addition to her paintings she is also known as a community based artist, environmentalist and advocate for the lands, waters and Indigenous peoples. She is currently a lead organizer for the Onaman Collective which focuses on resurgence of language and land based practices. She is also the lead coordinator for Walking With Our Sisters, a community-driven project that honours murdered or missing Indigenous women. Her work Giniigaaniimenaaning [Looking Ahead] commemorates residential school survivors, their families and communities to mark the Prime Minister’s historic Apology in 2008 and is installed at Centre Block on Parliament Hill commissioned by the Government of Canada. She was named the Aboriginal Arts Laureate by the Ontario Arts Council in 2015. In 2016 she won a Governor General’s Innovation Award and was named the winner of the 2016 Premier’s Awards in the Arts. Author of Medicines To Help Us (Gabriel Dumont Institute, 2007) and Beadwork (Ningwakwe Learning Press, 2010). Christi’s work is found within the permanent collections of the National Gallery of Canada, the Art Gallery of Ontario, Gabriel Dumont Institute, the Indian and Inuit Art Collection, Parliament Hill, the Thunder Bay Art Gallery and Canadian Museum of Civilization, First People’s Hall. 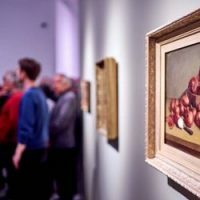 The Reunited Islands is the brand new permanent exhibit at the Musée d’art de Joliette. Produced as part of the Politique d’intégration des arts à l’architecture.